US President George W Bush is due to make his first public comments on Iraq's weapons declaration since America announced its view that Iraq is in material breach of UN resolutions. Secretary of State Colin Powell said on Thursday that omissions in the document meant that Baghdad was "well on its way to losing this last chance" to avoid military action. Mr Powell stressed that the US still accepted that weapons inspectors should continue their work in Iraq, but warned that the burden was on Baghdad to prove that it did not have weapons of mass destruction. He was speaking soon after the chief weapons inspector, Hans Blix, told the UN Security Council that the declaration showed that Baghdad had missed an opportunity to fill in gaps in the evidence. BBC Washington correspondent Justin Webb says there is a sense of satisfaction in the White House at the outcome of the Security Council meeting. The US is optimistic that it is winning its argument at the UN that Iraq cannot be trusted to disarm itself, our correspondent says. Resolution 1441, which led to the return of weapons inspectors to Iraq, threatens Baghdad with "serious consequences" if it fails to comply with UN disarmament demands. The White House is now expected to provide more intelligence to the weapons inspectors and to push for interviews to be conducted with Iraqi scientists. Omissions reported by Washington and UN inspectors include attempts to procure uranium and aluminium tubes needed to enrich it. A fact sheet issued by the US State Department accused Baghdad of seeking to procure uranium from Niger for the creation of nuclear weapons, and omitting this from the arms declaration. It is the first time the US has officially identified a country it believes was contacted by Iraq in order to find uranium. The International Atomic Energy Agency, which supplies some of the UN weapons inspectors working in Iraq, said additional information was needed. "There is nothing in the report about the effort to procure aluminium tubes. That is the kind of evidence we need," said IAEA director Mohamed ElBaradei. Iraq's deputy UN Ambassador Mohammed Salmane insisted the arms declaration was "complete and comprehensive" and would be borne out by UN inspectors. 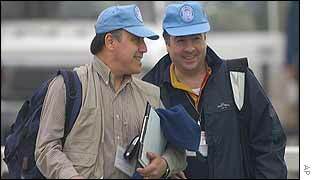 But the UN's chief weapons inspector, Hans Blix, also criticised the declaration. "There has been relatively little given in the declaration by way of evidence concerning the programmes of weapons of mass destruction," Mr Blix said after briefing the Security Council. Mr Blix said evidence that weapons that were known to exist in the 1990s had really been destroyed was missing from the document. Promising further analysis and new inspections, he added that he and Mr ElBaradei would return to the Security Council on 27 January. Our Washington correspondent says that the US is confident that, by then, Saddam Hussein will have dug himself into deeper trouble. "The Western Allies haven't shown the UN their intelligence"